This article was originally published on CommonEdge as "African Architecture: Ornament, Crime & Prejudice." I have always been fascinated by architectural theory. Over the years I’ve read a wide range of works, but none of them intrigued, perplexed and unsettled me as much as “Ornament and Crime,”Adolf Loos’ controversial polemic written a handful of years before the outbreak of World War I.
I first came across Loos’ essay as a young African design student living in Europe. The essay unnerved me for two reasons: I was studying to become a “modern” designer, reading the appropriate canon of literature, but I’d come from a culture deeply rooted in ornamentation, so the piece felt like a direct affront on a key aspect of my cultural identity. Even then, as an unschooled designer in my twenties, I knew different. 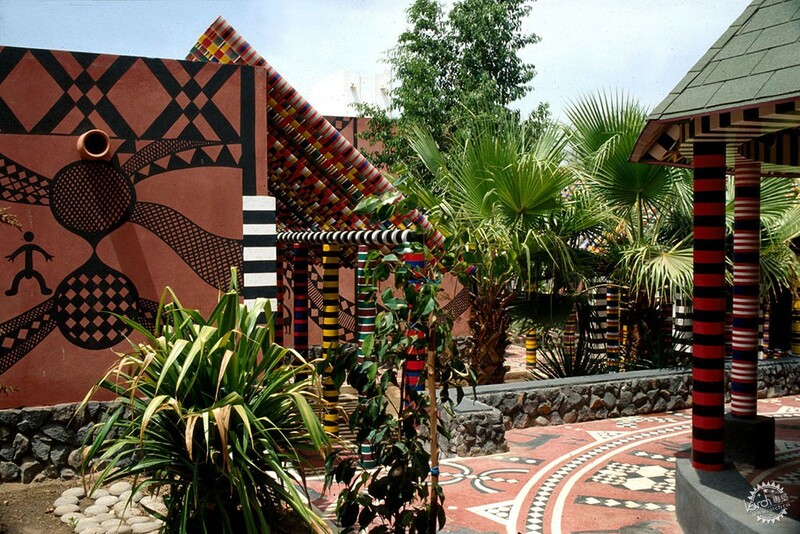 In traditional African societies, the use of ornamentation in art and vernacular architecture is essential. It connects most local tribes to their earlier civilizations and tribal cosmologies. Without ornamentation, the history of most African tribes would be incomplete because, these symbols are not mere decorations, or sources of decadent pleasure (although they remain pleasing to look at), they are deep and subtle repositories of history. For most African tribes, ornamented traditional buildings, tell stories through pattern, color and ornamentation, either with free-standing sculptures or as reliefs embedded into walls, door panels, and other architectural elements. In traditional Yoruba architecture, for example, the figurative house posts used to support the roof are like totem poles, with one sculptural element stacked atop another, representing a pantheon of deities or even a roll call of battles and tribal conquests. For these tribes, architectural ornamentation also acts as a shared means of communication. The complexity of the individual languages of most African tribes and their linguistic limitations often made it difficult to present their histories in written form, so the tribes typically resorted to iconographies, most of which they etched on buildings, utensils, clothing and furniture. Some African tribal words are difficult to translate into everyday English; often there are no literal meanings for certain words, just inferences. And because there were numerous ethnic groups and sub-groups, all of whom spoke different languages and dialects, it was difficult presenting these histories in a single language that everyone understood. Different tribes had different levels of literacy. As a result, some tribes devised their own indigenous systems of literacy, using unique pictograms. The Adinkra symbol from the old Ashanti Empire is still used as a motif on fabrics created by the Akans in Ghana. In his remarkable book, Religion and Art in Ashanti, Robert Sutherland Rattray identified, recorded and interpreted at least fifty of these symbols. For instance, the symbol of a palm tree (Abe Dua) connoted wealth, self-sufficiency, toughness and vitality, while that of the hen’s feet (Akoko nan) signified parenthood, care, tenderness and protection. The Igbo people in South East Nigeria had a similar ideographic writing script called the Nsibidi, which was also used by other smaller ethnic minorities in Nigeria’s Niger-Delta. 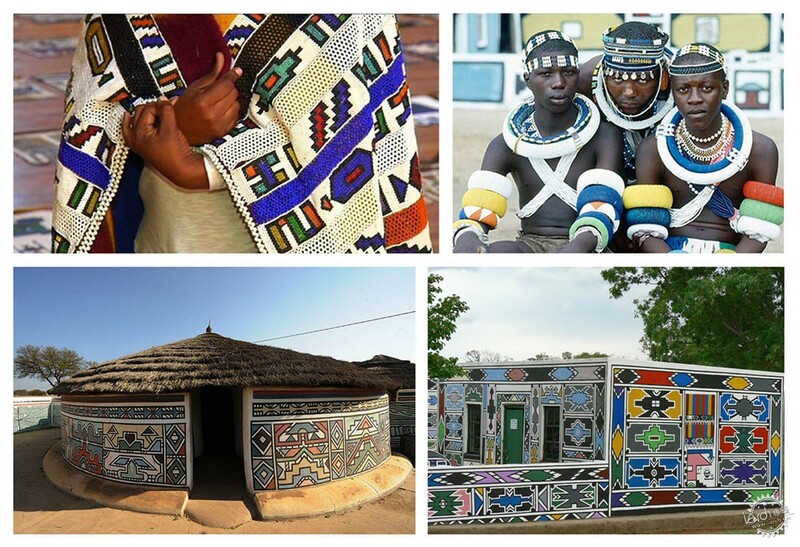 The Ndebele people of Southern Africa conveyed a whole range of emotions through the bright patterns painted on their homes: everything from the cryptic symbols of political resistance, displayed in plain sight, to spite their Boer oppressors, to motifs used to express grief, joy, prayers, even the social status of the homeowner. Today these patterns are still in use, because they represent a bit of recorded history that no culture can afford to completely discard. 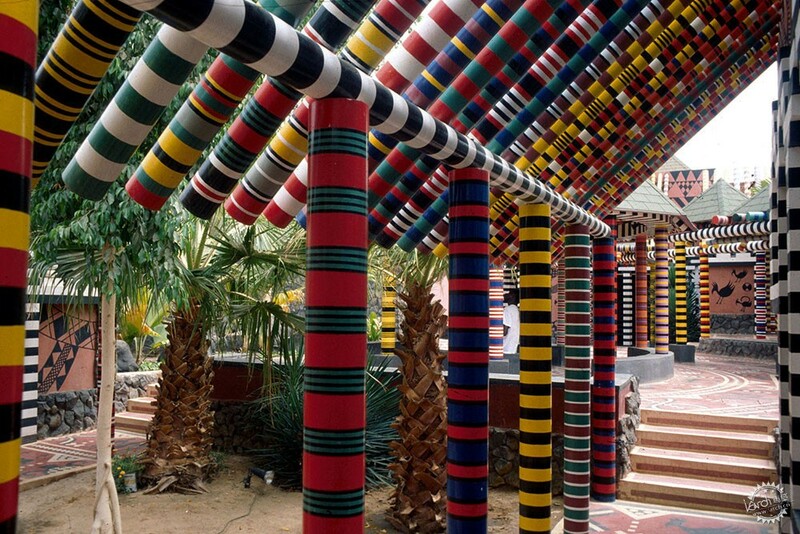 They remain relevant in even contemporary African architecture: the Alliance-Franco Senegalaise, designed by Patric Dujaic, in Kaolack, Senegal, won the Aga Khan Award in 1995 for its dynamic use of some of these ethnic patterns and colors. If Loos were alive today, he would certainly be mortified by current aesthetic trends, which border on the downright criminal. Rather than fulfill his infamous prophesy of building “...an all-white city—where all the building walls were painted in glowing white—just like Zion”, today’s modernists are increasingly embracing color, pattern and ornamentation, and are using complex building forms where plain white boxes would have sufficed in the recent past. 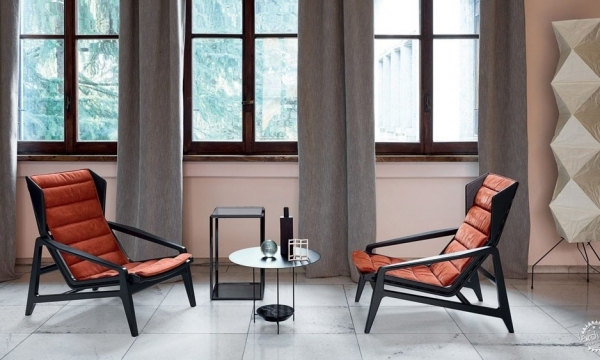 African ornamentation is today finding its way into other spheres of contemporary design. The Spirit of Ori art patterns (inspired by traditional Yoruba mythology) designed by New York-based Nigerian Laolu Senbanjo, have become popular not just among the African diaspora, but all over the world. Some of these patterns grace cognac, designer perfume bottles, and even Nike sports apparel. Whether this is ultimately a good thing is perhaps the subject for another essay, but it’s clear that the beauty of African ornamentation exerts a powerful pull. As it turns out, Loos had it wrong, not just by a little, but by an epic chasm. Contrary to his predictions, African societies won’t move forward by discarding its ornaments. (Maybe no society will.) Today erasing history, denying our collective identities, and rejecting the deeper pleasures of acknowledging the past, are the real crimes. 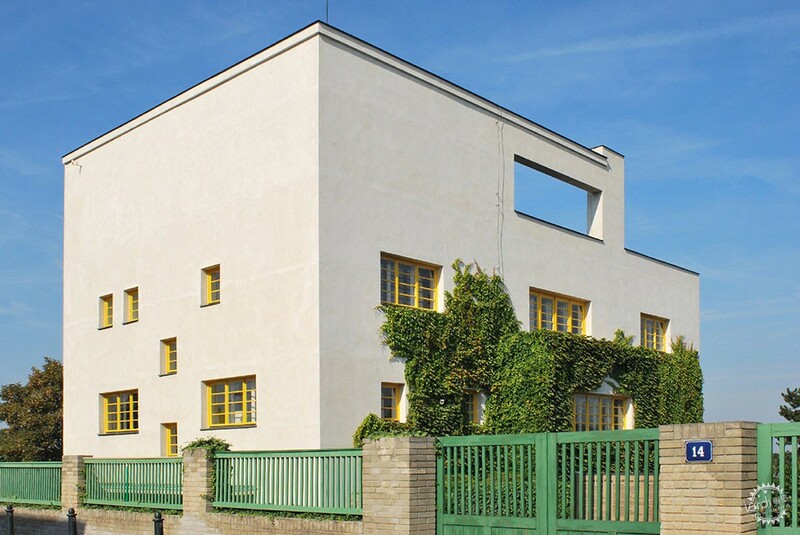 Today, we can thank Adolf Loos for reminding us of that. 建筑师应该遵循道德准则吗？/ Should Architects Follow a Code of Ethics?